People who travel a lot — and people who dream about travel a lot — spend a lot of time online comparing flight prices, reading hotel reviews and planning their dream trips. And I am no exception. So when the good folks at Skyscanner asked me to take their online travel comparison site for a test drive, I was excited. Is there anything better than doing what you love for work? If you don’t know, Skyscanner is the #1 leading flight comparison site in Europe, and they are gaining popularity in India, Asia and elsewhere. Skyscanner is available in 30 languages, dozens of currencies and searches about 1,000 airlines. The internet and mobile versions get about 32 million visitors per month, total, and the app has had 12 million installs so far. And all of this was started by three IT guys who thought they could build a better travel comparison site. After testing Skyscanner out, I think they were right. I found it easy to use, and it has all kinds of great features I have never seen before. 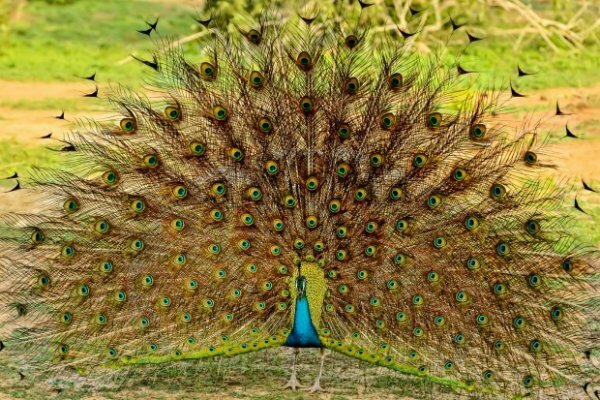 Find me a flight to India! 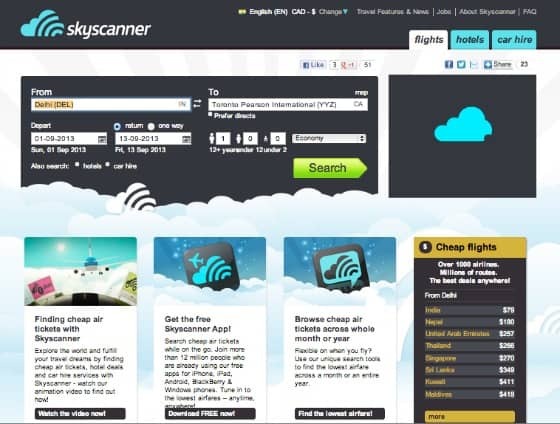 As you can see from the home page, above, Skyscanner has a well-designed and fun interface. One of my favourite things about Skyscanner is the simplicity. There are not a lot of tabs or options, but all the right ones are there. It just searches three things: air fares, hotel prices and car rental fees. And below the flight search area, the three most useful options are highlighted: a tutorial video, the Skyscanner mobile app and one of the BEST features on Skyscanner — the ability to search airfares for a time period, from one week to one year. But more on that feature later. If you look at the very top menu bar, after the country version (flag) and currency, you will see a link called “change.” If you click on it, a pop-up box appears that very easily allows you to choose country, language and currency. As I travel between Canada and India, I was interested in seeing prices in Canadian dollars and Indian rupees, and Skyscanner makes it super easy. I am planning to fly to India from Toronto in September, so I used Skyscanner in a real-life test, as you can see below. As an Apple computer die-hard (I’ve used Apple computers since the launch of the Macintosh Classic in 1987! ), I like the highly visual, graphically fun and icon-rich interface. I can focus in on the times I want, or reduce the journey duration (definitely used that one!) by just sliding a bar; and bold icons show at a glance whether you have to pay for food on board, or if the airline charges for bags or seat selection. And what’s also great is the quality of results you get back: Skyscanner compares all the domestic airlines, including Indigo and SpiceJet in India; and also the major OTAs like ClearTrip and Goibibo. As mentioned above, one of my favourite features is the ability to look at airfares over a period of time. This is really useful if you want to travel somewhere, and want to go when air fares are cheapest — because we all know that air fares go up and down with the seasons. This feature is not quite as easy to use as most of the other features, though; I’m still figuring out how to utilize it most effectively. TIP: Click on the link in the highlight box on the home page for a tutorial on how to use this feature. 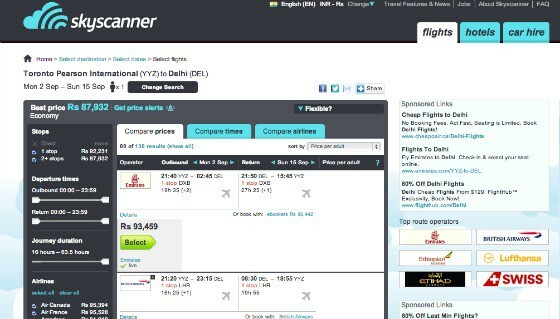 Important note: Skyscanner searches air fare prices, but it’s not a booking site. When you find a flight (or hotel or car) that you want to book, you get sent to a third-party site, such as an airline site or OTA (online travel agency). 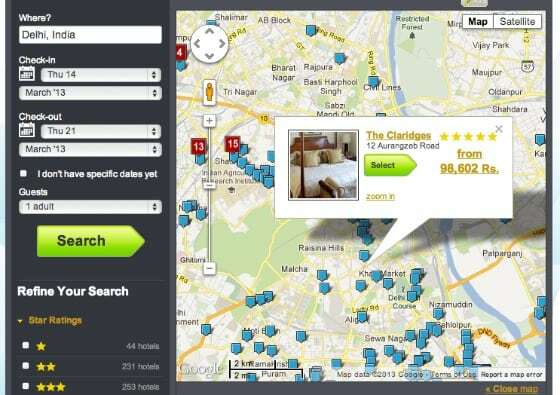 The other feature I was keen to try was hotel search, and one of my favourite ways to search is by map. Skyscanner has made it easy to search by location — and also proximity to airports and sites, or by neighbourhood, price, guest rating, amenities and more. There seem to be an unending number of ways to search for a hotel. So I decided to zero in on South Delhi, my favourite part of my favourite city in India. I clicked on the map, scrolled to South Delhi, and clicked on a few blue flags until I saw one I liked. Skyscanner very quickly and succinctly pulled together virtually everything you need to know about this hotel, including a gallery of photos, a description, price and, best of all, “Guest Reviews.” Everyone likes to read hotel reviews by real people. You find out whether the place is clean, or under renovation, or whether the staff is friendly or the food in the restaurant is good — all the things hotel brochures and websites don’t tell you. This is another one of those brilliant Skyscanner features: it amalgamates a slew of online guest reviews from various other sites about the property in question. 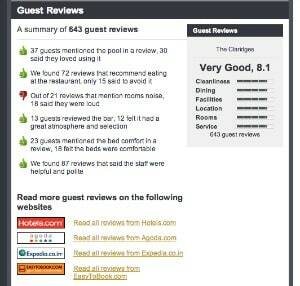 So what’s great about this feature is that you can see trends: yes, it’s friendly and comfortable, it has a great pool and good food … but it’s noisy. There’s a lot more to Skyscanner, too, and the app and the Car Hire section are worth checking out too. But for cheap air tickets and hotels, I’m sold. 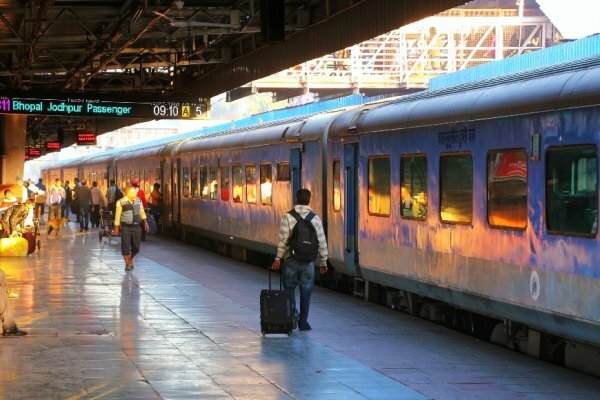 Check out this post for lots of tips and recommendations on travel by train, plane and automobile in India. NOTE: This post was brought to you by Skyscanner, but the opinions expressed are genuine. I don’t accept assignments unless I fully endorse the product or service. Skyscanner is an excellent online travel comparison site.